There are countless ways to celebrate the Husky legacy, whether it’s gathering together to watch the team or celebrating what makes the UW special. No matter where we travel, one thing remains the same: a strong sense of Husky pride! Traveling down the I-5 corridor. You don’t have to travel to the Puget Sound region to get your dose of purple pride — the UW Alumni Association is taking the show on the road! Over the past year, UWAA has hosted receptions with UW President Ana Mari Cauce for alumni and friends in Bellingham, Bremerton and Tri-Cities. 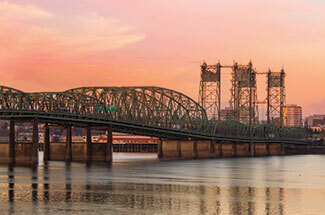 On Jan. 28 and 29, UWAA and President Cauce traveled three hours south to Portland and Vancouver. The trip began with an evening reception at Plaza del Toro in Portland and continued with a morning breakfast at the Hilton in Vancouver. Together with other events around Washington, the country and even the world, these energizing events are just more examples of how UWAA meets the UW community where they are. Love for the purple and gold has no timezone nor expiration date! Cheering on the team with your Dawg pack. The UW men’s basketball team had an exciting season on their way to a Pac-12 championship and berth into the NCAA men’s basketball tournament. It’s the kind of season to be remembered and enjoyed with your Dawg pack! 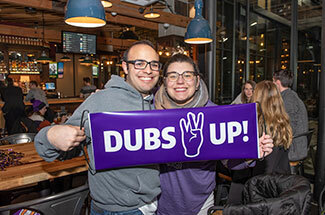 In a first-time joint event, UWAA’s GOLD (Graduates of the Last Decade) members and members of the Young Tyee Club gathered together at Redhook Brewlab to watch the Huskies take on the Arizona Wildcats on Feb. 7. These Husky faithful got a free pint glass and a Dubs Up “rollabana.” Go Dawgs! Honoring the UW’s finest. 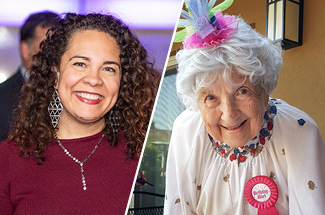 Celebrating our Husky legacy includes recognizing those bright figures who represent the UW at its boundless best. This year, we’ve been able to honor two people who have profound impact on our UW community. On Feb. 4, we presented the Distinguished Service Award (DSA) to Professor Ralina Joseph. First awarded in 1970, the DSA recognizes outstanding service or devotion to the UWAA, the UW and alumni community. Joseph, an associate professor in UW’s department of communication, is also a faculty facilitator for Interrupting Privilege, a workshop series that brings UW students and alumni together to explore race and equity. On April 12, UWAA traveled to Wenatchee to bestow Aurora Valentinetti with the Distinguished Teaching Legacy Award (DTLA). The DTLA recognizes the UW teachers who inspired and influenced their students long after they left the classroom. Valentinetti is the UW’s most beloved puppeteer. If you want to learn more about Valentinetti and her craft, you don’t need to travel as far as Wenatchee where she lives — the joy of discovery is just a ferry ride away. The Aurora Valentinetti Puppet Museum in Bremerton celebrates the art of puppetry through creative, historical and cultural experiences for all ages. Destination sunshine. Dawg Days in the Desert is a time-honored tradition, a touchstone of the UW’s Southern California community. For this annual event taking place every March in Palm Desert, University leaders, alumni and friends gather for a series of lectures and events sponsored by social groups and colleges. 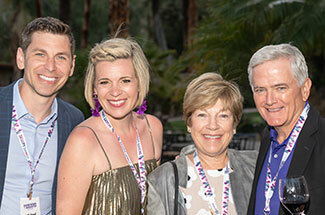 This year UW luminaries included Husky Football Head Coach Chris Petersen, UW Provost Mark Richards, UW Director of Athletics Jennifer Cohen and legendary television personality Robb Weller, ’72, among others. Want to soak up a little bit of the sunshine? Enjoy these photo galleries from two of the celebration’s signature events, Desert Scholarship Luncheon and Chow Down to Washington, both hosted by the UWAA.